Glad they went out of their way to remove the only bike lanes between Smithfield and 26th. Yeah, there is zero need for a pedestrian sidewalk on the South side of carson up against that wall. What would you need to get to? @marko82, there are four bus stops on that side of the road and they do get used, particularly the one in front of Terminal St.; it’s an unpleasant place to get off the bus, and the lack of a sidewalk definitely contributes to this. I can imagine anyone waiting for the bus there or waiting to cross the street after getting off the bus must feel like a sitting duck. Ideally, we would see both a sidewalk and a bikeway, or even an elevated bike/ped. path here. People already cross the street to get to the bus stops and the addition of a sidewalk will result in even more pedestrian traffic and yet all they are putting there are a couple pedestrian crossing signs? Not even a painted crosswalk or two? 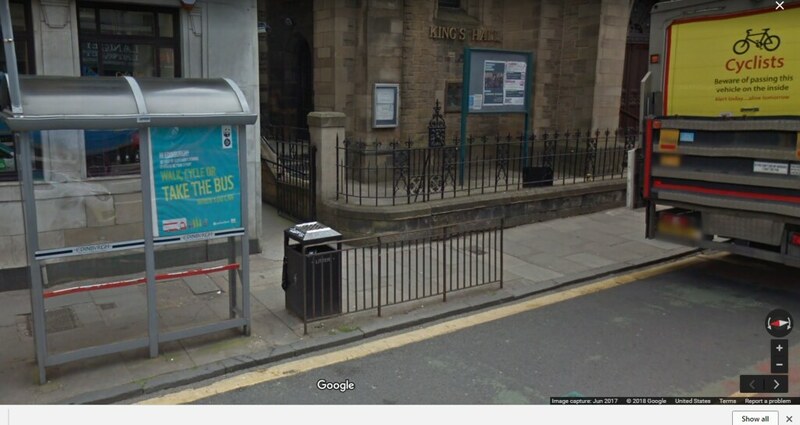 This reply was modified 1 year ago by greg h.
@chrishent, thanks for correcting me, I hadn’t thought of the bus stops. I would still like to see the bike lane stay though – with proper pedestrian crossings where needed. I also think it is almost criminal that the major intersections don’t have ped-only walk phases (Barnes dance). Especially at 18th street which is one of the most dangerous in the city for car/ped crashes. If the future sidewalk is basically in the exact same place as the current bike lane, and just as wide, and is not really in much of a “business district” so will probably have few pedestrians, then is there really much of a difference? It will basically be a raised up bike lane, and will be a big improvement for people who are scared to ride on the road in that stretch. Well, except some of us avoid riding on sidewalks so we don’t inconvenience pedetrians, so there’s a difference. Ideally there would be some sort of street design strategy that the city could sign on to which would make provision for pedestrians and cyclists as well as motorists. Hopefully, due to the redevelopment at that station square parking lots, through streets parallel to East Carson may be re-connected. Which would be helpful. Again, who knows when, the southside trail is a patchwork of detours and reroutes currently. I’m sure it will all be much better in a decade. I used to always go on KcKean/Bingham east (and west) bound. Once they bike-laned E. Carson, I switched to that. It’s much smoother (and fewer cement trucks barreling out full speed). I don’t have an issue with pedestrian accommodation, especially at bus stops. I’m not sure we need the entire Arlington-7th(?) stretch sidewalked, if any of it. But definitely islands for bus people (ideally with a pedestrian-actuated traffic light). And with the bike lane on the inside (possibly unintuitive). It would certainly contribute to traffic calming; that stretch could surely use it. All this verbiage, all these plans, to avoid addressing the real problem: Speeding cars. You can’t drive a car through there at 24 mph, either direction, without suddenly getting four close friends breathing down your neck. It sounds like a car drove off East Waterfront Drive, across the GAP / Steel Valley Trail, and into the Monongahela River on 4/6. The driver was rescued. If the location is what I suspect, this is in Munhall, east of the Waterfront and just east of the big blue Marcegaglia building, where the road & trail make a bend to the right. It’s near the Marcegaglia and Brismet signs. The trail diverges from the road at this spot and the road bends right over the railroad tracks. Drive too fast and you could go into the river. No one hurt. If you ride in the area, expect higher traffic on side roads for a while. A letter to the editor in response to Scott Bricker’s March letter, in which a motorcyclist grumbles that he has to do license & registration, while cyclists don’t. Rialto closed indefinitely to cars and peds after bridge that crosses it found to be deficient. children of the couple who were killed in Oakland reached a settlement with the city based off of the city admitting that their designed intersection sucked. Freeport Butler trail to install better gates to keep cars off trail. WESA radio did a nice little story about Nick Ross, chair of Walk Ride North Side, the bike and pedestrian advocacy committee of the North Side Leadership Conference. They discussed Northside’s bike lanes. Where on the Southside is this again? And how will it impact the trail? As I recall from when they were first talking about this–I may be wrong–McKnight are interested in extending the trail; it’s the gravel plant next door (Frank Bryan Concrete) and the railroad that are the blockers. This is right next to the Liberty Bridge. If you google “Terminal Way, Pittsburgh”, that is the road that goes in between the two sides of the building. It is on the stretch where there is no riverfront trail, between Station Square and the Southside. If you are coming from the Southside and cross the train tracks onto that cobblestone road detour, you are right next to it. Amusingly, Terminal Way is the location where I was gonna place a Tag-o-Rama tag last week, but aborted because certain features I wanted to utilize weren’t available, plus they had a sign up about signing in with the guard, which made it feel “private property-ish”, which is invalid for T-o-R. Nice view from the end of that pier/bridge/whatever tho. Detour is 2nd to 4th, right? I’ve been there plenty of times but never knew the street names. So they’re going to develop terminal way itself and have access to the river? So maybe it’ll make the detour a tiny bit shorter. 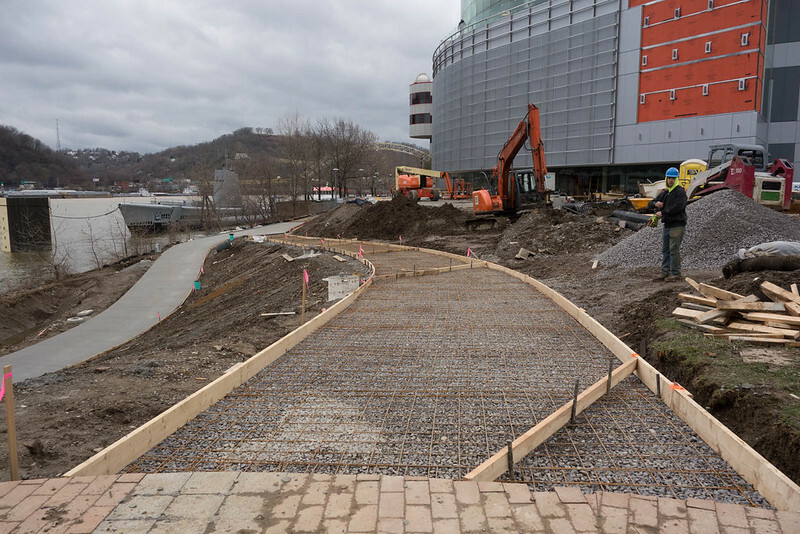 The new sidewalk and bike trail near the Carnegie Science Center is taking shape. Is it the perspective, or is the new sidewalk a bit wider than the old with the hillside to the right a bit less steep? It does seem to look that way, but cameras can definitely play tricks. The old sidewalk was uncomfortably narrow when there was a lot of pedestrian traffic. Yay. It was closed earlier today along with the whole street. I guess the strip trail will be open again around 2022. Transportation plan linked with flood control project in the Run. Danny’s marathon mentioned in passing on the GCN Show.